Intuit’s SmallBizHack hackathon in Toronto this past weekend set teams racing to create an app that improves the lives of small business owners. One of the apps that stood out in the final pitch presentations was an impressive social listening app called hAI!, leveraging Clarifai’s AI to enrich image data from public social shares. Want to build your own computer vision model? Sign up for your free Clarifai account! I caught up with the team behind hAI! and asked them to tell me a bit more about how they built this cool app (in only 24 hours)! Below is my interview with siblings Raymond Chow, Brandon Chow, Leon Chow, and Lyuping ‘Fiona’ Situ. Skip: Thanks for taking the time to tell us more about hAI! Can you give a summary of your app and how it works? hAI is a tool designed to help small businesses gain more exposure on social media. We felt that a lot of businesses are hesitant about making that push to digital marketing, while those that do are gaining a massive advantage. 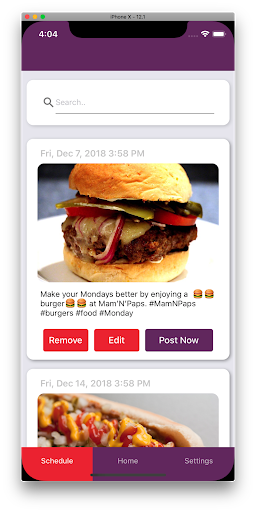 Using our tool, businesses can make posts to all their social media outlets from a single app, as well as being able to schedule posts or queue posts as a recurring scheduled post (eg. Weekly posts). In addition, after taking the picture, we can use AI and machine learning to generate a description and hashtags using factors such as image concepts, date, type of business, etc. We can compare image results with analytics on posts that have succeeded in the past to see the likelihood of the image succeeding, then recommend the user retake the picture or use a provided image. Skip: How did you form your team? What motivated the team to take on this project idea? Brandon: We easily formed our team because we are actually siblings! Raymond and I are both software engineers in Toronto. Leon and Fiona are currently studying computer science and web design, respectively, and were interested in this opportunity to learn. Many of our uncles manage their own restaurant businesses and we also have a cousin that is a social media contractor for various restaurants around Toronto. Because of this, we noticed that a lot of small businesses use social media as another outlet for advertising, which also allows for the business to get more involved with their community. We thought it would be a good idea to develop a tool that can help businesses that didn’t already have a digital presence to adapt more easily . Skip: How did you build it? How did your group work together to achieve the final hack? Brandon: We built hAI! by using React Native for our frontend, for its cross-platform capabilities and rich user community, and Azure Functions as our backend to implement Clarifai, for its ease of deployment, scalability and, more importantly, the ability to rapidly develop and collaborate using multiple languages. Our backend was developed using event-based actions with .NET Core and NodeJS. Raymond and I took ownership of the frontend and backend, respectively. Leon handled researching the various integrations that we would need later on in the hackathon, as well as attending the learning sessions while Fiona focused on the UX design, logo design, and branding for the mobile application. Skip: Which Clarifai APIs did you use and why? How did you integrate it into your app? Raymond: We used the Clarifai Predict API, using the general model, for the images taken by users to get the concepts and confidence associated with each concept. With this data, we generate an automatic description for the post. These values are saved and used to compare against new images to determine the likelihood of new images succeeding. 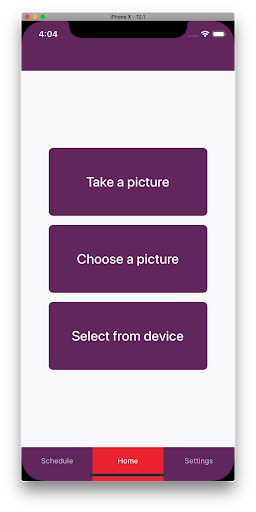 We also had plans for using the image search feature to search images for users if the success percentage was below a certain threshold, so we can recommend them a better picture to post. 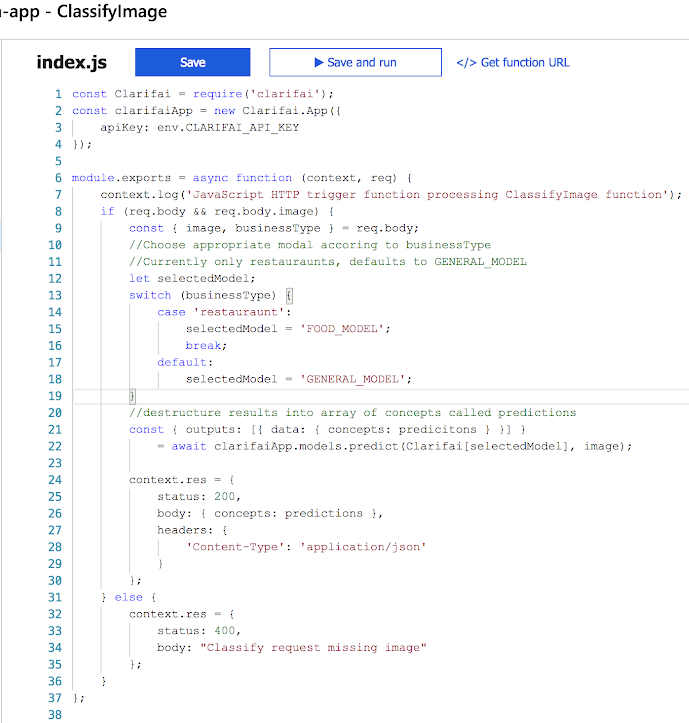 The Clarifai API was integrated in the backend using an Azure Function with NodeJS. In the future, with different types of businesses, different models can be used to predict against the images. For example, restaurants can use the food model. Currently, I (Raymond), am experimenting with the Apple SDK, as I just learned about it at the Hackathon! Skip: Anything else you’d like to say on behalf of the team? Raymond: It was a really fun project, and we plan on taking it further from here as an interesting side project as we feel it has good potential. I will continue tinkering with the Clarifai API and look forward to what you come out with in the future! Thanks again to team hAI! for sharing this amazing hack! hAI! is just one of the many amazing Clarifai projects that came out of SmallBizHack Toronto. Are you interested in using Clarifai's AI vision for your own project? Join us in London on February 23rd & 24th, 2019 for the next Intuit SmallBizHack! Can't make it? Sign up for Clarifai and try it out on your own, for free. You can use the Clarifai API up to 5,000 times every month for absolutely zero cost. What are you waiting for? Get hacking!